Aalborg XS-TC7A is an efficient exhaust gas economizer for auxiliary engines. It is designed to significantly reduce the oil consumption for the oil-fired boiler. Constructed with smoke tubes, the Aalborg XS-TC7A is an exhaust gas economizer for main diesel engines. It is available in two models, both of which have a vertical design and a high gas velocity that minimizes fouling. 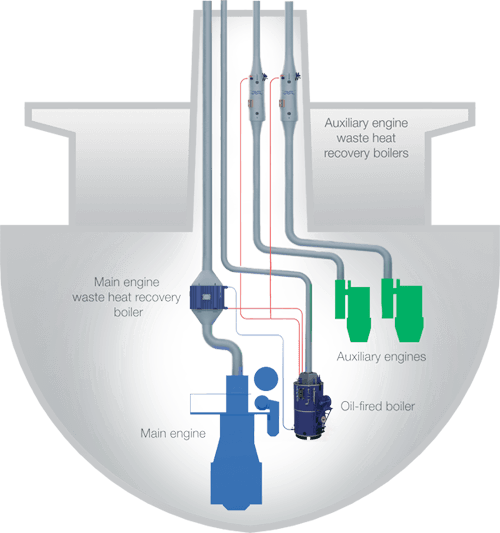 In respect of environmental and operational enhancement products, Alfa Laval has recently introduced a new range of waste heat recovery (WHR) boilers mainly directed at the retrofitting market (but also well suited for the newbuilding market). This new product range will provide operational savings while improving the environmental profile of the ship and company. For several decades, we have installed waste heat recovery (WHR) systems after the ships’ main engines and these units are to a large extent able to meet the vessels’ steam requirement during seagoing operation and for some installations also able to assist with the generation of electrical power. The waste heat from the auxiliary engines has not been considered in the past, but it actually contains a large amount of energy which can be utilized to supplement steam requirements during port stays and - for some vessels - also during voyage. The WHR concept has been developed as a customized solution with special focus on energy generation compared to return on investment and has a very short payback time of down to 4-6 months in optimum cases, but normal payback time will be approximately 1 to 1½ year depending on the number of days the produced steam can be utilized (offset against the steam requirement from the oil fired boiler) and the redundancy requirements. We offer a highly efficient and reliable concept based on wellproven and innovative solutions to ensure the best operation conditions and optimal return on investment. The design of the heating surface of the WHR boiler is the result of an enhancement of our unique technologies with a small footprint and the lowest possible weight to output ratio. To ensure the most advantageous design, the WHR boiler concept will be specially tailored to the individual ship and engine design with due consideration of existing uptake back pressure, etc. The concept comes in two designs: one that requires a steam space in another boiler (e.g. in an existing auxiliary boiler) and one that has its own steam space. Exhaust gas from the auxiliary engines has been an overlooked energy source. But because the cooler exhaust of long-stroke main diesel engines can be insufficient to support steam needs, it is becoming more attractive. Auxiliary engine exhaust gas can fulfill steam requirements during port stays or even en route. At today’s high fuel prices, the Aalborg XS-TC7A exhaust gas economizer has a typical payback time of 1–1.5 years.